Raiders quarterback Derek Carr wanted to get his contract extension done before training camp next month. Carr and the team have reached what is reported to be a five-year, $125 million deal, according to a story by Ian Rapoport of NFL.com Thursday morning. An excited Carr confirmed that report on social media. 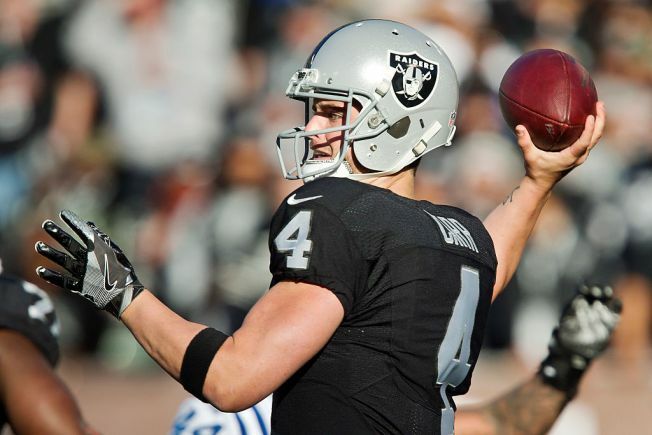 The deal is expected to pay Carr about $25 million per season, which will make him the NFL’s highest-paid quarterback. He’s heading into the final year of his first deal, signed after he was taken in the second round of the 2014 draft. That deal will pay him about $5.4 million this season, with the new terms kicking in starting in 2018. The Raiders have been built with salary-cap flexibility under general manager Reggie McKenzie and are a reported $31 million under the salary cap. Earlier this offseason, the Raiders signed defensive end-linebacker Khalil Mack to a long-term extension. Still to be done is a deal for starting guard Gabe Jackson.